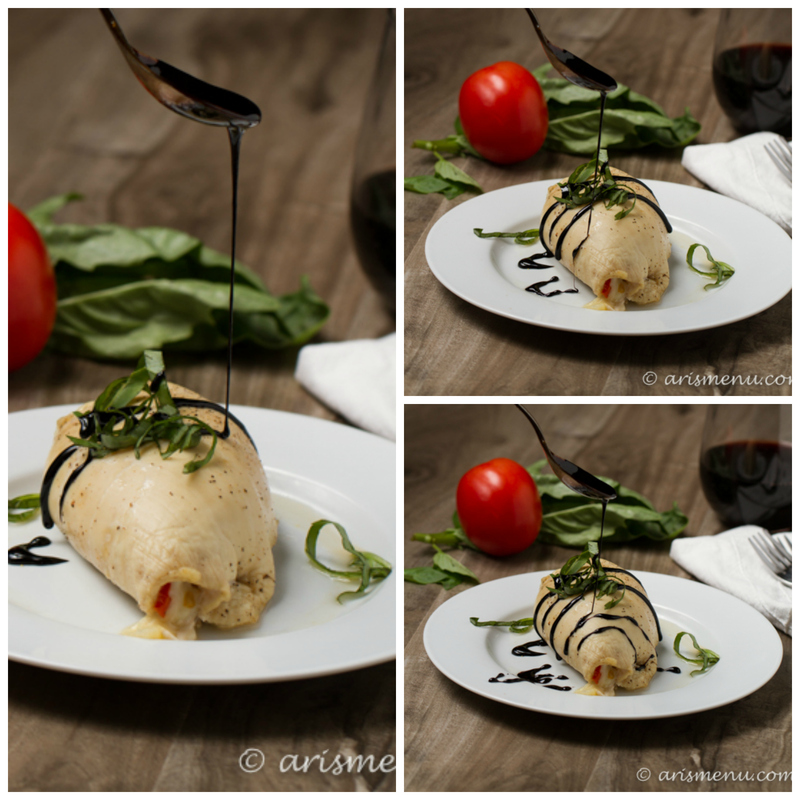 A simple, healthy dinner with smooth & melty mozzarella, sweet roasted tomatoes, and a decadent balsamic glaze. Looks impressive, but it’s so easy anyone could make it! Pssssst….Stick around for a sweet giveaway at the end of this post! Can you believe it’s almost February? I always forget how quickly February comes after the holidays. I feel like I’ve just finished celebrating Christmas and New Years, and before I know it everyone is asking what the plan is for my birthday, and I have no idea because February feels sooooo faaaaarrrr awaaaayyy. It’s okay though because Target refuses to let you forget. I swear someone comes in at midnight on Christmas day and explodes sappy Valentine’s Day pink and chocolate all over the place. You know what I do miss? Valentine’s Day at school. Like, in elementary school. You know when you were forced to make them for the entire class, and the day was so fun because you’d have parties in all of your classes, and you went home feeling totally sick after eating nothing but chocolate for 7 straight hours? I miss that. Usually these days we keep things pretty low key, and make dinner at home because we are both kind of anti social and avoid crowds at all costs. Plus, I love making something healthier and fancy at home where I can control what goes into it and get exactly what I want. Like this chicken! It’s seriously so healthy, but so impressive and it beats the pants off your average steakhouse dish. 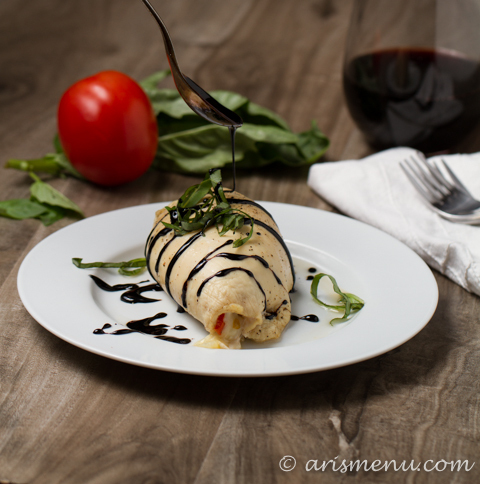 With melty mozzarella cheese and roasted tomato coming out in every bite, and the ridiculously good balsamic glaze drizzled on top, this dish will win anyone over for any occasion. 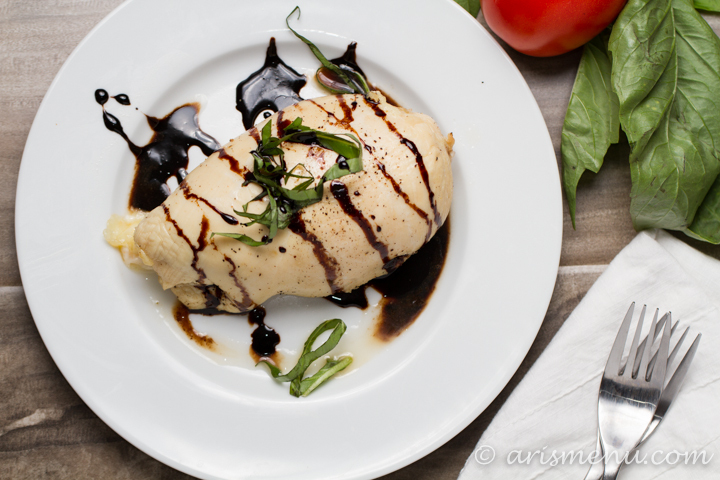 A simple, healthy dinner with smooth & melty mozzarella, sweet roasted tomatoes, and a decadent balsamic glaze. Looks impressive, but it's so easy anyone could make it! Preheat oven to 400. Spray a small baking sheet with nonstick spray. Lay tomato slices in a single layer. Lightly drizzle with olive oil and season with salt and pepper. Roast until tomatoes start to bubble and brown, about 15-20 minutes. Reduce heat to 375. Season both sides of chicken with salt and pepper, then either butterfly the chicken or pound out until thin. Fill each chicken breast with cheese and tomatoes. If you butterflied the chicken, then fold the top over and secure with toothpicks. If you pounded it out, then roll the chicken around fillings length-wise and secure with toothpicks. Lightly drizzle with olive oil and bake until chicken is fully cooked and juices run clean, about 25 minutes. Meanwhile make the balsamic glaze by pouring balsamic vinegar into a small sauce pan over high heat. Bring to a boil and reduce to medium-medium high to simmer. Stir occasionally until sauce approaches desired thickness (it will continue to thicken when removed from heat). This took me about 30 minutes for a very syrupy glaze. 20-30 minutes should be all you need. Once chicken is finished cooking, top with fresh basil and balsamic glaze. You want to time the glaze so that it is ready when the chicken is cooked so it doesn't harden while you wait. Serve immediately. Leftovers can be refrigerated in an airtight container for up to 5 days. 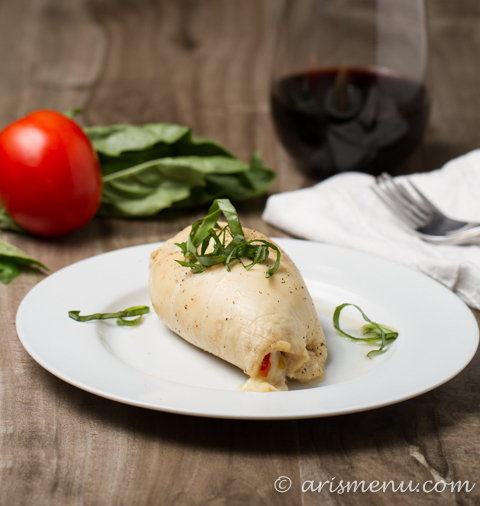 *To chop fresh basil, roll tightly then thinly slice just before serving. It wilts very quickly, so you want to save it until the last minute. So to celebrate Valentine’s Day (or just celebrate our love for jewelry 😉 ), I’ve teamed up with some of my favorite food bloggers to give away a $500 Tiffany’s gift card giveaway! This giveaway is furnished by, well, US! As a special gift for you guys to say I LOVE YOU! The giveaway will be open from Monday January 27th, 2014 until Sunday February 2nd, 2014 (@ 11:59pm EST). You must be 18 years old to enter and you must live in the USA. One winner will receive a $500 Tiffany’s gift card. Please check out my fellow recipe blogging buddies that are also hosting! They all have amazing recipe, beautiful photos, and lots of greatness to share with you! 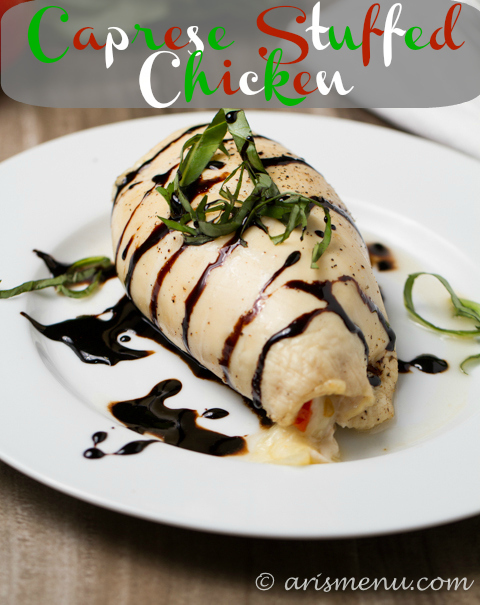 One of my fav recipes from last year was a grilled caprese chicken. This looks just as good! That sounds awesome! I’ve been on a total caprese kick ever since I made it into a pasta dish last year. MIZ recently posted…My FAT to FIT fabrication. I’ve never even looked in a Tiffany’s but every girl likes the little blue box! 😉 This looks awesome…yet again! I know…I don’t know how they do it, but they certainly know their way into a girl’s heart! Agreed! It always seems like it would be so complicated, but it’s actually really easy too! Trust me, if it was super complicated, I would most likely not be making it. If dinner takes more than half an hour of prep, I get frustrated real quick, haha. Thanks friend! This looks delicious!!!! I will be making this very soon…. WOW you made that chicken? Looks gourmet, fancy restaurant style. “romantic,” dare I say! Haha thanks! You know, Valentine’s Day around here just isn’t the same as it was when I was in elementary school. Nowadays the kids can’t even make a valentine box. They all have to have paper pockets made at school that are all the same so no one has something better than anyone else. Seriously??? I mean, I get it, but I guess I just feel like someone will always have “something better” and that takes away all the fun! I love this idea of eating in.